The committee has been relatively inactive for several years but I am making an effort to revive it through this web site and other activities. I am anxious to hear from anyone interested in discussing and researching the various stamps in this fascinating series. This study group is primarily a group of one, its chairman, who fields questions from members on various aspects of this fascinating series. Steve will begin publishing articles on this web page surrounding the various American stamps he has acquired and still to acquire as well as featuring publications he is using as the basis for research. Additional articles will continue every month or so to detail more of what has been discovered. All contributions are welcome and questions posted to my email address will be posted here as well allowing for the collective membership to provide answers. One of the many benefits of USSS membership is the opportunity to join one or more of the groups within the Society which focus on the study of a particular area of U.S. philately. A quick glance at the masthead page in any issue of The Specialist will reveal the wide range of choices available. I am pleased to announce the revival of the Americana Series Study Group Web Site, (ASSG) dedicated to the study of the definitive series known as the Americana Series of United States postage stamps, which were issued from 1975 to 1981. This web site is an offshoot of the original web site which was developed and maintained by predecessors who managed this group before me. My sincere appreciation to their efforts and hopefully I will provide the excellent leadership they did. The focus of the group will be to study the printing, varieties, errors, First Day Covers, rates and usages of the series. The aim of the group will be to share information and findings and to encourage further study of the series. 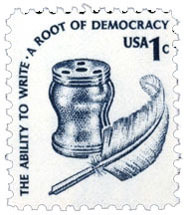 To this end, the ASSG will produce an electronic newsletter entitled The Iron Betty (after the design of the 50¢ stamp in the Americana Series and following in the footsteps of those who have managed this study group in the past), in which the group will encourage members to share their thoughts, opinions, and findings about the Americana Series. Additionally, the group will publish periodic progress and findings reports in The Specialist. Membership, of course, is free and is open to anyone who wishes to study the Americana Series stamps. The Chairman of the group is Stephen A. Vieira, a relative novice in the study of the Americana series. He can be contacted by mail at 7 Huttleston Ave., Fairhaven, MA 02719. I strongly urge anyone who already has an interest in this wonderful series or who is looking to begin a new area to collect to contact me. You’ll find that there is much more to this series than just the famed CIA invert.